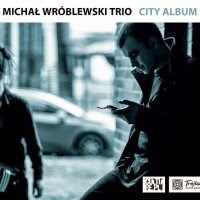 This is the third album by the young and very gifted Polish Jazz pianist/composer Michal Wroblewski, which sees him returning to the piano trio format with bassist Michal Jaros and drummer Pawel Dobrowolski. The album presents eight original compositions, all but one by Wroblewski, with the exception being a piece based on the music by Frederic Chopin and arranged by Wroblewski. The music was recorded (same as his debut album) at the now legendary Studio Tokarnia, with Jan Smoczynski doing his usual sound magic with spectacular results. The music, as stated by Wroblewski, was influenced by playing a concert tour in 2013 with American superstar trumpeter Terence Blanchard, but the experience influenced also the trio's approach to music, which became much more focused and intense. As a result this album is remarkably stronger and vital than the two earlier efforts, even though those two were already first class achievements, and places Wroblewski just a notch higher on his way to fame and fortune. His compositions, as usual, combine the right amount of melodic substance with lyrical contents and harmonic beauty, very much like many Jazz standards do. Listening to this album is a true delight from start to finish, with time passing by in a breeze. Of course a piano trio is only as strong as all three musicians involved and Wroblewski is extremely lucky to find two partners who fulfill him completely, match his sensibilities, his virtuosity and his elegance. This piano trio is a classic example of what a piano trio should sound like in the mainstream Jazz milieu. Yes, this music does not make any groundbreaking discoveries as far as Jazz is concerned, but we need to keep the legacy alive and this trio is just perfect in that capacity. It is difficult to predict how Wroblewski's career will develop from this point on, but he certainly already made his mark both as a pianist and a composer. I am certainly keeping my eye, or rather ear, on his moves, as he managed to impress me for the third time in a row. Jazz fans who love the piano trio format will have a field day with this one. Well done indeed!